The first couple months of the year, you’ll see lots of people making new year’s resolutions. 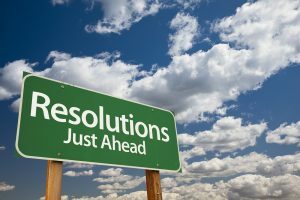 A lot of times, these resolutions that people have for their lives for the coming year include commitments to hit the gym more, eat more vegetables, or to turn off the TV and pick up a book more often. Here are some resolutions that you may not have thought of but are still just as good. These resolutions all have to do with lawn treatment in Atlanta. The key to a healthy lawn is healthy soil. 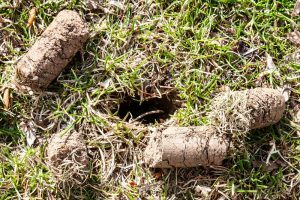 The best way to maintain healthy soil is to aerate it. Over time, the soil on your property may become hard and compacted, especially if you have heavy foot traffic moving across your lawn. The harder your soil is, the more difficult it will be for it to absorb nutrients. Aeration helps your lawn avoid this soil compaction and allows it to take in water and nutrients more readily. Watering your grass properly is the key indicator of how healthy your lawn will be over time. Proper watering ensures your grass develops strong, deep roots as well. You’ll need one inch of water per week to be as healthy as possible, and may be most effective when delivered all at once rather than smaller sessions every day. Mowing the lawn is not just a cosmetic treatment. Mowing regularly and the right way is very healthy for your grass. However, many people mow too often and cut too much off for it to really be beneficial. When cutting your lawn, make sure you aren’t cutting more than one-third of the blade. The longer each blade of grass is, the deeper the roots go. Longer blades are better able to absorb nutrients and water from the soil. Overseed treatment involves applying grass seed to your existing lawn. This is particularly helpful if you have large bare patches on your grass due to insect infestations, disease, or drought. Overseeding can give your lawn a major boost if it’s struggling to grow over these unsightly bare spots. It may also help grass that is sparse in spots look fuller and healthier. When you’re dedicated to keeping your lawn looking its best, call the professionals. An experienced lawn and landscape maintenance team can give you even more ideas about how to take care of your grass and plants, and provide guidance and suggestions as to what kind of things to plant on your property. Hiring professional help to maintain your lawn throughout the year is one of the greatest ways to pull off the best yard on the block this year. A lawn that looks amazing is a very worthy goal for this year. As you carefully think about the new year and what you want to accomplish, don’t forget about your home. A new and improved lawn can make your home look more inviting and make it a better place for you and your family to hang out. These resolutions for lawn care in Atlanta can not only improve your life; they may also be easier to stick to. Talk to the team at TurfPride Inc. to learn more!